Praise be to whichever deity you worship for the food at Aladdin is truly wonderful. I think officially, Aladdin is an Armenian restaurant. Or maybe owned by Armenians. Not knowing a damned thing about Armenian food, I’m going to describe the restaurant as Lebanese/Mediterranean. This might be a horrible mistake that causes offense to all that read this review… apologies if that’s the case. As this far as this type of food goes, it’s the best I’ve had in a long, long time (though I live in Rwanda where we only have two Lebanese-style restaurants, so give that as much clout as you think it deserves). During my 10 day visit to Addis I ate here for lunch three times and dinner once. So that gives a little insight into how much I like the food here. The meze meal (150 birr) is a personal favourite but it’s only available for lunch, unfortunately. 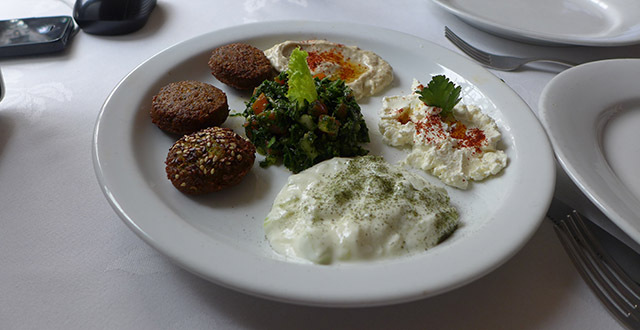 For me, Lebanese food is all about the dippy things and the meze plate gives you a good sampling, allowing you to choose five items from a list of about seven. 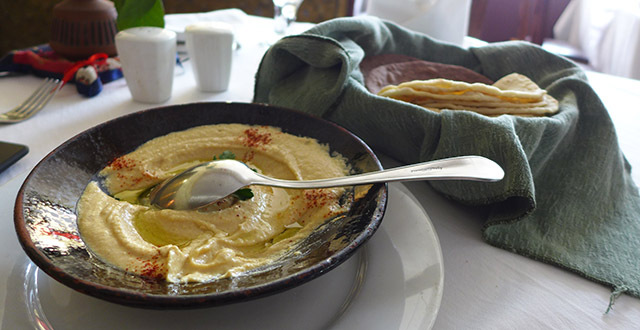 I tend to go with the classics of hummous, tabouleh, babaganoush, labneh, and tzatiki which come with plenty of pita (although the last time I was here it was more like chapati) for dipping. They start you off with a lentil soup (delicious) and a salad (lettuce, tomato, and cucumber and kind of uninspiring). All of the dips are great with the minty tabouleh being a personal favourite. 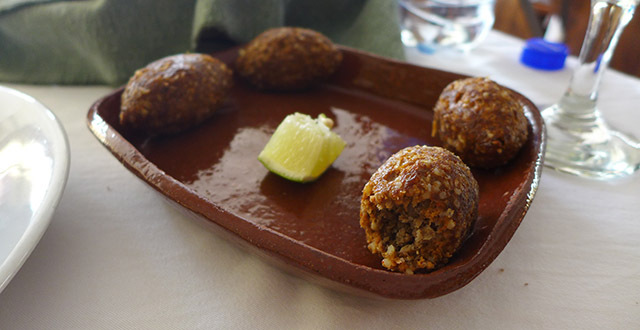 I’m a big fan of Aladdin’s kofte (85 birr) as well. Little meaty bundles of joy! I’d recommend getting something to dip them in. If you’re ordering your dishes separately, they each cost around 85 birr and, with the included pita, would probably be enough for one person for a light meal. Bring some friends, order a few! 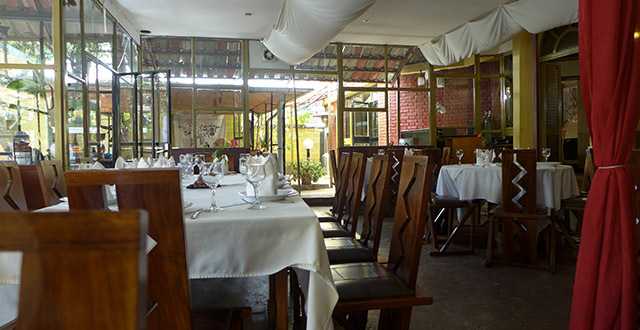 Other menu items include kebabs (beef, chicken, yoghurt, and fish) for 190 birr each, Greek salad, (110 birr), and entrees like fish plaki (190 birr), sempugov jash (190 birr), and sineh kofte (190 birr). I haven’t tried anything other than the dips and kofte though so let me know what you think! I’ve got it on good authority, though, that the starters are what this place is all about and if you’re with a group of people, skipping the entrees and sharing starters is the way to go. Finish your meal off with a strong coffee (12 birr) and something sweet! They have a few dessert items on the menu from baklava (100 birr) to khadif (100 birr) to lokhma (60 birr) to plain old ice cream (85 birr). Or for you adventurous types, give their chocolate salame a try for 90 birr. Nope. I have no idea what that is. The wait staff are attentive without hovering around too much which makes this a nice place to hang out for awhile with a book or computer if you happen to be on your lonesome. The wifi is good here and there are quite a few tables near plugs in one of the inside rooms. I’ve hunkered down here several times to do work and it’s a nice, quiet place where I always manage to get a lot done. Aladdin isn’t the cheapest place in town but the prices are, I think, pretty fair for the size and quality of the food. It’s one of my favourite Addis spots and I’d recommend giving it a try and letting me know what you think in the comments below!